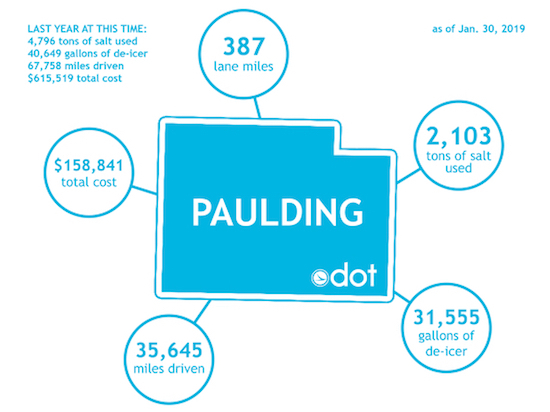 PAULDING – The following is an update regarding snow and ice operations on state highways within Paulding County from November through Jan. 30. This report is issued periodically during the winter months and as necessary following snow and ice events. … for a total cost of $158,841. Those numbers are significantly lower than the same time last year. In January 2018, ODOT had used 4,796 tons of salt and 40,649 gallons of de-icer and had driven 67,758 miles for a total cost of $615,519.